Bootie LA – ’00s Mashup Night: T’00 S’00n? 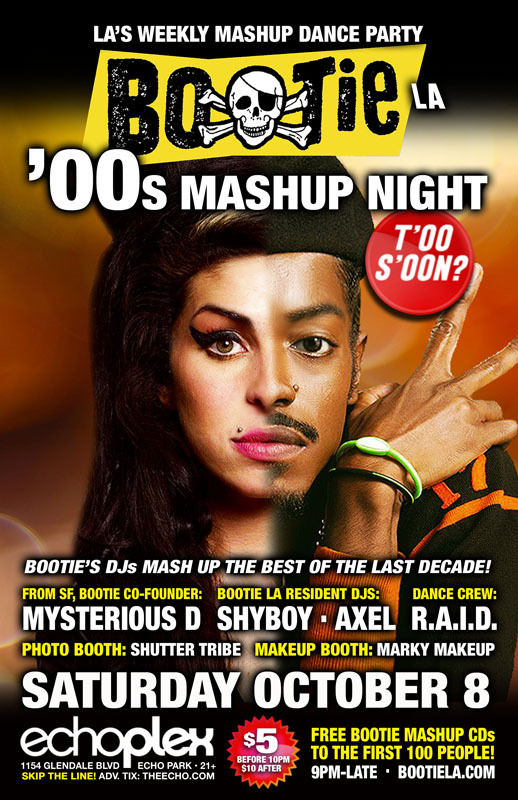 Los Angeles Bootie LA – ’00s Mashup Night: T’00 S’00n? The “aughts” seem like they were just yesterday, but Bootie LA is already nostalgic for the 2000s ... so we’re paying tribute in full mashup style with ‘00s Mashup Night: T’00 S’00n? From Britney to Eminem, Outkast to Amy Winehouse, Lady Gaga to Beyoncé, White Stripes to M.I.A., no genre or artist is safe! Only $5 before 10 PM! ’00s MASHUP NIGHT: T’00 S’00N? Bootie mashes up the best of the last decade! Bootie LA celebrates the odd mess that was the last decade — with world-changing things like iPods, smart phones and American Idol; from the demise of the boy bands to their return; to child stars like Britney and Lindsay turning into adult messes — it’s ‘00s Mashup Night: T’00 S’00n? With the top of the music charts alternating between Beyoncé and M.I.A., Eminem and White Stripes, Outkast and Amy Winehouse, it was a decade of contrasts — and Bootie LA DJs Mysterious D, ShyBoy and Axel will mash up the best ’00s songs all night long! Plus Bootie LA’s resident dance crew R.A.I.D. (Random Acts of Irreverent Dance) throws down their regular go-go antics, Marky Makeup gives your faces and bodies the look of the aughts, and house photographers Shutter Tribe will be there to capture all the action! All this, plus FREE Bootie mashup CDs for the first 100 people through the door!